This set of foam modules can be used to create motor-skill circuits for young children in mini-gym sessions (going through, over and under, with round, square, rectangular and triangular shapes), but also for everyday practice with apparatus. 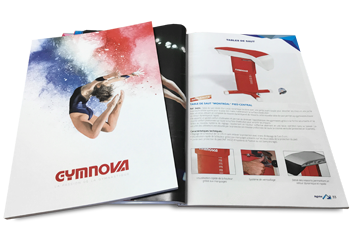 The position of hook and loop strips on each of the elements allow endless possible combinations (end of beam, dismounts off parallel bars, behind vaulting table or push-off pad for second flight practice). 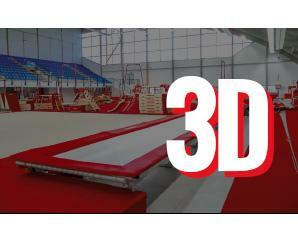 May be placed under the beam for safety during practice and allow gymnasts to get used to its height. 1,000 denier "leather look" phthalate free PVC cover with class M2 fire rating. - 1 "U" module = 200 x 150 x 80 cm (Lxwxh). - 2 base modules = 200 x 50 x 40 cm (Lxwxh). - 2 triangle modules = 100 x 50 x 40 cm (Lxwxh). - 2 rectangular block modules = 100 x 50 x 40 cm (Lxwxh).